LA JOLLA, CA—One of the big mysteries in biology is why cells age. Now scientists at the Salk Institute for Biological Studies report that they have discovered a weakness in a component of brain cells that may explain how the aging process occurs in the brain. 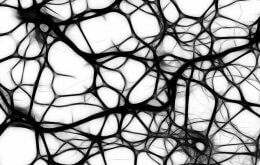 The scientists discovered that certain proteins, called extremely long-lived proteins (ELLPs), which are found on the surface of the nucleus of neurons, have a remarkably long lifespan. While the lifespan of most proteins totals two days or less, the Salk Institute researchers identified ELLPs in the rat brain that were as old as the organism, a finding they reported in Science. The Salk scientists are the first to discover an essential intracellular machine whose components include proteins of this age. Their results suggest the proteins last an entire lifetime, without being replaced. ELLPs make up the transport channels on the surface of the nucleus; gates that control what materials enter and exit. Their long lifespan might be an advantage if not for the wear-and-tear that these proteins experience over time. Unlike other proteins in the body, ELLPs are not replaced when they incur aberrant chemical modifications and other damage. Damage to the ELLPs weakens the ability of the three-dimensional transport channels that are composed of these proteins to safeguard the cell’s nucleus from toxins, says Martin Hetzer, a professor in Salk’s Molecular and Cell Biology Laboratory, who headed the research. These toxins may alter the cell’s DNA and thereby the activity of genes, resulting in cellular aging. Funded by the Ellison Medical Foundation and the Glenn Foundation for Medical Research, Hetzer’s research group is the only lab in the world that is investigating the role of these transport channels, called the nuclear pore complex (NPC), in the aging process. This microscope image shows extremely long-lived proteins, or ELLPs, glowing green on the outside of the nucleus of a rat brain cell. DNA inside the nucleus is pictured in blue. The Salk scientists discovered that the ELLPs, which form channels through the wall of the nucleus, lasted for more than a year without being replaced. 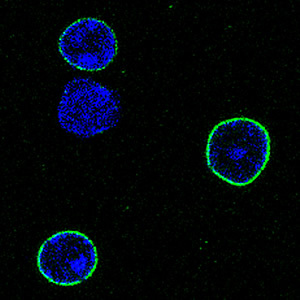 Deterioration of these proteins may allow toxins to enter the nucleus, resulting in cellular aging. Previous studies have revealed that alterations in gene expression underlie the aging process. But, until the Hetzer lab’s discovery that mammals’ NPCs possess an Achilles’ heel that allows DNA-damaging toxins to enter the nucleus, the scientific community has had few solid clues about how these gene alterations occur. The results that Hetzer and his team report today suggest that declining neuron function may originate in ELLPs that deteriorate as a result of damage over time. “Most cells, but not neurons, combat functional deterioration of their protein components through the process of protein turnover, in which the potentially impaired parts of the proteins are replaced with new functional copies,” says Hetzer. “Our results also suggest that nuclear pore deterioration might be a general aging mechanism leading to age-related defects in nuclear function, such as the loss of youthful gene expression programs,” he adds. The findings may prove relevant to understanding the molecular origins of aging and such neurodegenerative disorders as Alzheimer’s disease and Parkinson’s disease. In previous studies, Hetzer and his team discovered large filaments in the nuclei of neurons of old mice and rats, whose origins they traced to the cytoplasm. Such filaments have been linked to various neurological disorders including Parkinson’s disease. Whether the misplaced molecules are a cause, or a result, of the disease has not yet been determined. Also in previous studies, Hetzer and his team documented age-dependent declines in the functioning of NPCs in the neurons of healthy aging rats, which are laboratory models of human biology. Hetzer’s team includes his colleagues at the Salk Institute as well as John Yates III, a professor in the Department of Chemical Physiology of The Scripps Research Institute. When Hetzer decided three years ago to investigate whether the NPC plays a role in initiating or contributing to the onset of aging and certain neurodegenerative diseases, some members of the scientific community warned him that such a study was too bold and would be difficult and expensive to conduct. But Hetzer was determined despite the warnings. He adds that without foundation funding, the study would not have progressed to the point that its findings are published in a leading journal.